In 1977, Voyager 1 left our planet. Its mission: to visit Jupiter and Saturn and to study their moons. The flybys were an enormous success. Voyager 1 discovered active volcanoes on Io, found evidence for submerged oceans on Europa, and photographed dark rings around Jupiter itself. Later, the spacecraft buzzed Saturn's moon Titan-alerting astronomers that it was a very strange place indeed! -and flew behind Saturn's rings, seeing what was hidden from Earth. Beyond Saturn, Neptune and Uranus beckoned, but Voyager 1's planet-tour ended there. Saturn's gravity seized Voyager 1 and slingshot it into deep space. Voyager 1 was heading for the stars-just as NASA had planned. "We call this region 'the heliosheath.' It's where the solar wind piles up against the interstellar medium at the outer edge of our solar system," says Ed Stone, project scientist for the Voyager mission at the Jet Propulsion Laboratory. Out in the Milky Way, where Voyager 1 is trying to go, the "empty space" between stars is not really empty. It's filled with clouds of gas and dust. The wind from the Sun blows a gigantic bubble in this cloudy "interstellar medium." All nine planets from Mercury to Pluto fit comfortably inside. The heliosheath is, essentially, the bubble's skin. "The heliosheath is different from any other place we've been," says Stone. Near the Sun, the solar wind moves at a million miles per hour. At the heliosheath, the solar wind slows eventually to a dead stop. The slowing wind becomes denser, more turbulent, and its magnetic field-a remnant of the sun's own magnetism--grows stronger. So far from Earth, this turbulent magnetic gas is curiously important to human life. 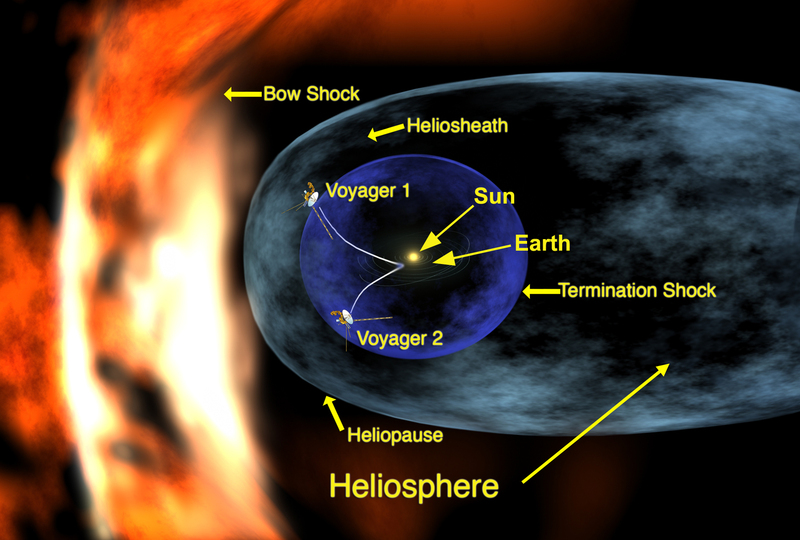 "The heliosheath is a shield against galactic cosmic rays," explains Stone. Subatomic particles blasted in our direction by distant supernovas and black holes are deflected by the heliosheath, protecting the inner solar system from much deadly radiation. Voyager 1 is exploring this shield for the first time. "We'll remain inside the heliosheath for 8 to 10 years," predicts Stone, "then we'll break through, finally reaching interstellar space." Voyager 1, after 28 years of travel, has reached the heliosheath of our solar system.